This bodycon dress will instantly boost your mood. Made in a figure-hugging silhouette, this piece is cut to show off your figure and features a ruffled, fluted hem. Try yours with an edgy jacket for a surprise twist!Also available in Powder Blue / Black / Red in XS/S/M/L/XLXXL. 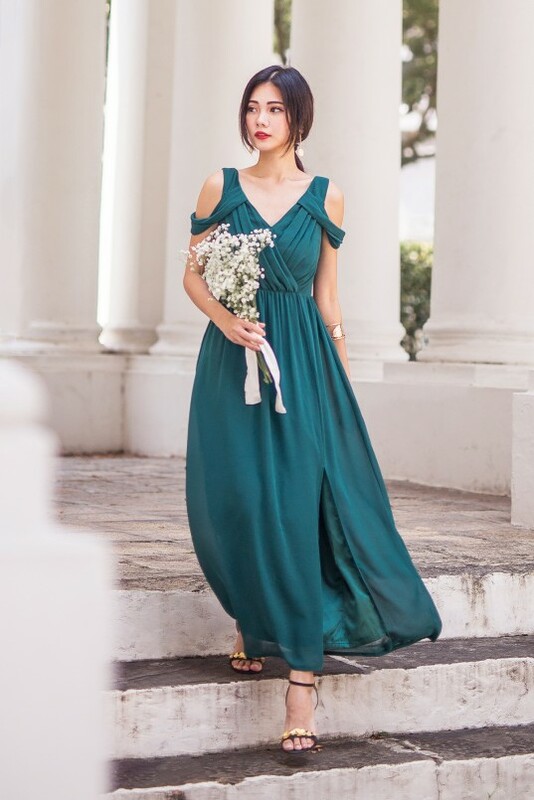 Inspired by Parisian style, this effortless jumpsuit has a sweatheart neckline topped with feminine frills cascading along both shoulder areas. Cut in a flattering silhouette that define your waist. Wear yours with heels to dinner parties!Also available in Navy in XS/S/M/L/XL. This straight-leg style features a pressed seam down the front. Complete this work-ready look by pairing it with matching blouse and blazer for the polished vibe that is ready for day or night. Also available in Sky Blue / Black in XS/S/M/L/XL. This structured work dress is cut for a body-hugging fit and can be worn with almost anything you have in your wardrobe with the right accessories. Featuring capped sleeves that add a feminine touch to your look. Also available in Rose Pink / Steel Blue in XS/S/M/L/XL. A great outfit makes your day, so choose wisely. Made in solid hues, this fluid dress skims the body with a flattering waist and overlaps details to define your figure. Wear it to formal appointments with your everyday tote. Also available in Navy / Burnt Orange in XS/S/M/L/XL. Throw on this pair of slit pants to elevate your everyday look. Made in a luxurious, dreamy fabric, this flattering number adds on a dramatic flair to your workwear essentials. Also available in Black / Floral in S/M/L/XL/XXL. We strive to place our design to focus on the female form - this peplum dress is cut to flatter your curves with the peplum waist and capped sleeves. Wow your coworkers by styling it with high heels and dainty necklace. Also available in Navy / Red in XS/S/M/L/XL. Let your mind relax as you spend a carefree day in this striped jumpsuit. A modern take on nautical styles, this stylish piece is crafted in a sleeveless cutting and a fitting bodice. Comes with sash for you to accentuate your waist with a self-tied ribbon. Also available in Navy / Blush Pink in XS/S/M/L/XL. This sweet floral number takes on a bohemian style. It features vibrant floral prints along the bodice, subtly puffed shoulders and ruffled hem. It wraps and ties nicely at the waist, while further accentuating your slim waistline. Simply match it with sandals to add on to the romantic element. Available in XS/S/M/L/XL. Slip on this casual, laid-back number this weekend! It's easy and versatile, with the statement-making slit that shows off your legs. Also available in Marigold / Black and in XS/S/M/L/XL. Midi dress are the most versatile. Either match it with sneakers for that laid-back look, or a pair of heels to spice up the outfit. This slim-fitting shape features colourblock prints and slits that soften this lovely frock. Available in Navy / Pistachio / Forest Green and in XS/S/M/L/XL.Restocks coming soon. Register with your email to be notified. A one-piece wonder that's perfect for all your year-end parties. Give your party dress a break and opt for a classy jumpsuit ensemble instead. Featuring a satin sash detail at the waist, pair this jumpsuit with heels as a finishing touch. Also available in Black / Powder Blue and in XS/S/M/L/XL. An updated version of a fit-and-flare that combines the versatility of crochet. Eyelet is quite possibly the easiest texture to work with. It's youthful, fun, and yet incredibly flattering. Just like this dress. Also available in White / Rustic Red and in XS/S/M/L/XL. We all love a good jumpsuit. And we love it even more when it’s a super cute work outfit! This smart number is an absolute stunner, and it’ll definitely elevate your work wear style. Need something more professional? The trick is to layer on a blazer.Also available in Black and in XS/S/M/L/XL. This party dress has been given a textured update with eyelet crochet details. This double strap ensemble is perfect for everything from parties to date nights. Need it casual? Opt for sneakers instead of heels - you will still look stunning.Also available in Periwinkle / White in XS/S/M/L/XL. A work dress that will definitely take your from desk to dinner. This mesh insert work dress is classy, elegant, and effortless. It’s a dark and mysterious beauty, and it will look gorgeous and smart when paired with simple heels. The panel pleating along the front also adds fun to the look. Also available in Black in XS/S/M/L/XL. 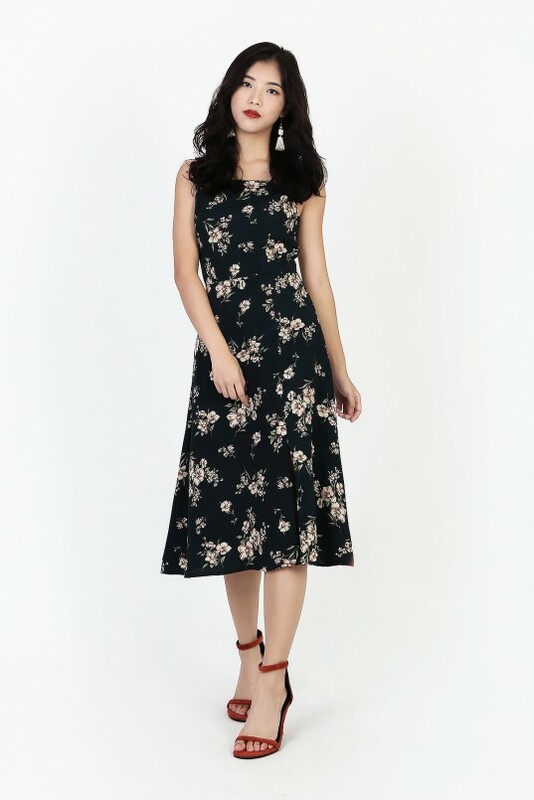 A fit-and-flare dress that’s both subtly unique and incredibly versatile. Don on this dress to mix up your work wear style. The details are stunning – stitching details line the dress as a way to add contrast and dimension to this beautiful look. Also available in White in XS/S/M/L/XL. There are more weekdays than weekends, which is why we're introducing to you different and unique ways to amp up your work wear style. This wrap dress is subtle and unique with its modern wrap detail on the front. It makes a statement while helping to cinch in your waist like a fit-and-flare.Also available in Navy in XS/S/M/L/XL. It's time to give the peplum an upgrade. The Reysta Peplum Dress features a beautiful panelled bodice in a v-cut, with asymmetrical peplum details along the waist. Let your inner #girlboss take over your style. Hustle on ladies!Available in Sky Blue / Navy in XS/S/M/L/XL. Sometimes all you need to complete the perfect day-time look is a beautiful floral midi. Paired with a woven bag and sandals will do wonders for beating our island's heatwave. For a night-time look, pair this with heels and swap your bag out for a simple clutch. Available in Cream in XS/S/M/L/XL.